Optimized for the digital era, THE BOX handles all the functions needed for production not provided by most DAWs, including mic preamps, input signal processing, high-quality mix bus, cue sends with talkback, monitor control, and more, without the redundant capacities of larger consoles. Most importantly, THE BOX provides the legendary “all discrete” API sound in an efficient, cost-effective package. “The BOX” provides four (4) input channels. Channels 1 & 2 are equipped with preamp, filter, built-in 550A equalizer, insert, assignable compression, and output routing. Channels 3 & 4 provide the same features, but are each equipped with an API 500 series slot instead of the built-in EQ. “The BOX” provides sixteen (16) dedicated summing input channels, as well as the four (4) input channels, for a total of twenty (20) channels. Accordingly, all channels, input and summing, have a fader, mute, pan-pot, program bus assignment, insert, solo, solo safe, and aux/cue sends. Additionally, summing inputs have a “0dB” switch that bypasses the fader and delivers the input signal to the pan-pot at unity gain. This feature is very useful for summing individual DAW tracks that have fader & mute automation. 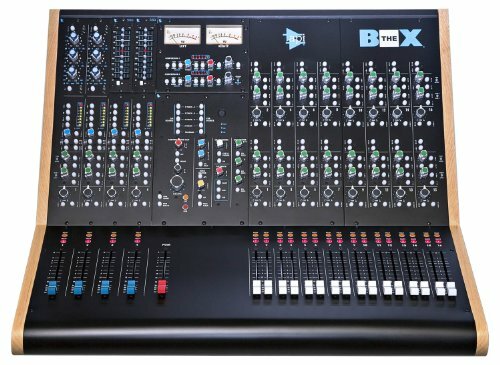 “The BOX” is equipped with a comprehensive master section that includes controls for program bus insert and external inputs, auxiliary and cue masters, solo master, talkback, VU meters, and a fully-featured monitor section that supports two (2) stereo speaker systems and headphones. In addition, the master section contains two (2) 527 compressors that can be assigned to the input channels when recording and the program bus when mixing. To help assure reliability and longevity, “The BOX” is built to the same exacting API quality standards as the Vision, Legacy Plus, and 1608 consoles.